While sleeker sharks rule the open waters, horn sharks hide out in the shadows of the seafloor. TheyÕre not graceful swimmers and don't move around like their streamlined kin, in fact, sometimes horn sharks use their strong pectoral fins to crawl along rocks. They first appeared nearly 140 million years ago. Horn Sharks prefer shallow waters less than 40 feet deep. They hunt at night and feed by crushing small animals with flattened back teeth. Spots on its body provide camouflage for swimming in sandy areas. The horn shark's average length is just over three feet, and itÕs named for its large fin spines. (Girard, 1855), Though with their long bodies the Sawfish looks very much like a shark it actually belongs to the ray fish family. They are grouped with rays partly because they have gill slits on the underside of their head. A sawfish uses this saw to nose around sandy bottoms to find food, and to slash at fish for food or defense. 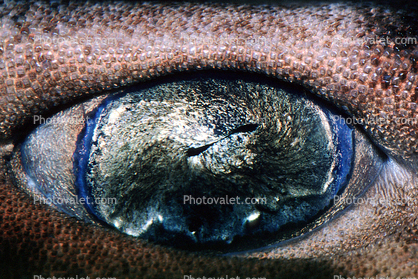 Like sharks, rays have special organs in their skin for detecting the electrical voltage of other animals. These sensors help them hunt for food. Smalltooth sawfish can be found in shallow coastal waters and tidal portions of rivers.